Okay, so it's Christmas and I'm beyond stressed out, frazzled and busy. Who isn't? Well, we got to church last week, it's the first Sunday of Advent. The kids get to go up front to bless the wreath and light the first candle. We come home, the house is all decorated, I have the 3 purple candles and pink candles, and I think, okay, I have a fake wreath and I know I have short taper candle holders somewhere. I hunt and hunt and discover that the short taper candle holders must still be somewhere in a box in the garage (the dining room as only been packed for 2 1/2 years..let's not rush into this) so I had to improvise. It is the thought that counts, right????? Notice the layer of dust on the one candle holder in the picture!! Like I have always said, dust is a decorating style. 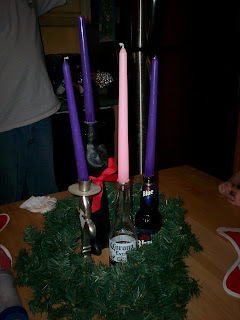 The black cat bottle is an empty wine bottle...and I know everyone recognizes the other 2 "candle holders". ROFL! You have a great sense of humor! I love it! You do what you have to in order to get by - nothing wrong with that! Not to mention, dust gives the cats something to play with - LOL!